Steven Ford and David Forlano (both born 1964, US), PillowCollar Necklace X, 2009. Although I don’t wear a lot of jewelry other than my wedding ring, I’ve always been fascinated with jewelry design. I’m pretty sure that jewelry was one of the few art forms that did not succumb to mass-production during the industrial revolution, unless one is talking about costume jewelry. 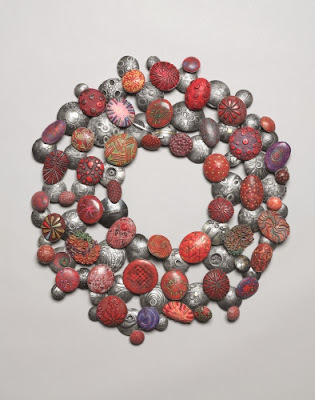 I’ve known countless jewelry artists and each one has given me a greater and greater appreciation of the art form, especially those who make the elements of their pieces (be it ceramic, glass, metal, etc.) themselves. I have a friend who makes gorgeous jewelry that features glass beads she makes by hand. Each of her pieces is unique as the result of her working the glass. For unique elements of a piece of jewelry, Ford’s and Forlano’s works are certainly standouts! While many artists in the past have risen to prominence as jewelry artists, such as René Lalique, Louis Comfort Tiffany, and Henry van de Velde, these artists mainly designed jewelry that was then hand made in their studios / workshops. Tiffany had a particularly big enterprise for jewelry production. Steven Ford and David Forlano emphasize one-of-a-kind, hand made jewelry that is a total collaboration. The two artists met while they were painting students in Italy. Forlano’s abstract paintings emphasized surface build up while Ford concentrated on making paintings that had three-dimensional impact. They began designing jewelry as a collaboration in 1988. One can certainly see their backgrounds as painters in their work. They work in the relatively new medium of polymer clay, which is not actually real clay, but consists of polyvinyl chloride. It has many benefits, such as a low firing temperature that does not require a traditional kiln and a variety of colors that can be blended like paint, It can also be sliced and woven together, and it does not shrink when dry like real clay. Ford and Forlano have exploited the medium to brilliant effect. This necklace shows their recent work that emphasizes forms that could be found in nature such as shells, seeds, and flower buds (which are certainly evident in this necklace). In their work, even in the case of earrings, they try to make each element distinct from the rest, while keeping an overall sense of unity with size and color. Studio activity (A Community Connection): Make a piece of jewelry that suggests natural forms. Use inexpensive materials such as clay, wood pieces, leather scraps, heavy paper, or wire. Experiment with ways to connect the materials, e.g. to make coils with wire wrap around a pencil or stick and then gently slip it off; to make loops, wrap wire in figure eights between nails on a board. Try to think how to express your own personality with shapes that echo nature.